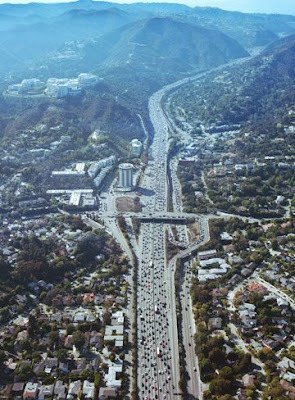 The French writer and philosopher Jean Baudrillard once wrote of the freeways of Los Angeles as being “ideally suited to the only truly profound pleasure, that of keeping on the move.” Indeed, nowhere is the pleasure of keeping on the move more profound than in a city whose freeways rarely offer it. Rush hour in Los Angeles is synonymous with gridlock, but the sheer enormity of the situation can be tough to grasp. Fortunately, there is the architecture photographer Benny Chan, whose Traffic! 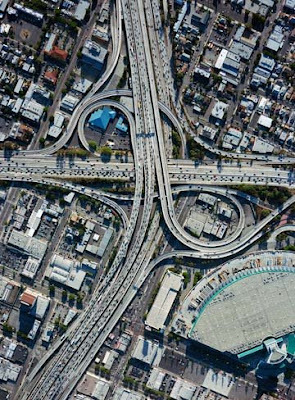 series depicts the scale of overcrowded lanes of rush hour traffic from high overhead. Shot over a few years during various helicopter trips, the photographs now stand eight feet high and six feet wide, and convey, quite effectively, the enormity of the problem—as well as the need to get things moving.